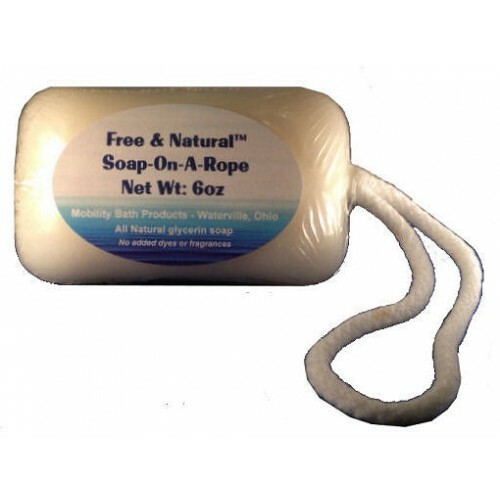 This rope soap is as gentle as baby soap and all natural! It was developed especially for those with skin sensitivities to the dyes and artificial perfumes found in most soaps. It does however include a hint of coconut for richness and lavender essential oil; the combination of which is quite pleasant! However,if you happen to have a sensitivity to either of these oils, this may not be the soap for you. This large 6 oz bar features a high quality, long lasting glycerin soap base and is all vegetarian, meaning it is cruelty-free with absolutely no tallow (a common ingredient in many soaps) used in the production. The 100% soft cotton rope is as gentle as the soap itself and slightly longer than most rope soaps for a little more comfortable grip. 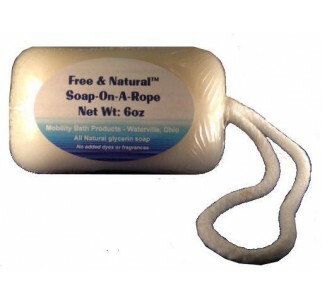 Free & Clear all natural rope soaps are 'born' in New Zealand. However, once you try a bar, we're confident you'll adopt it as your favorite soap-on-a-rope!